As an employee benefits consultant with Marsh & McLennan Agency (MMA), Megan provides advice on health and benefits plans, wellbeing/wellness programs and more to a diverse base of corporate clients. She is dedicated to helping corporate leaders understand the full scope, risk and costs of various employee benefits strategies and plan designs. Along with her team, Megan solves complex health challenges by utilizing healthcare cost containment strategies that create better health care consumers and keep employers current on all regulatory issues, including all those related to healthcare reform legislation. Megan joined Marsh & McLennan Agency in 2017. 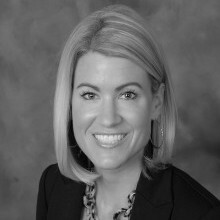 She provides over 13 years of diverse healthcare and insurance experience specializing in employer onsite medical clinic design and implementation, healthcare cost containment strategies and employer direct primary care solutions. Megan is involved in several community organizations including Blessings in a Backpack, United Way Milwaukee, the American Heart Association, Stone Bank School and more. Megan and her family reside in Hartland, WI.